TRY THE INTERACTIVE DEMO BELOW! The UV1000 series has been discontinued. You can contact our Sales Department to check on any remaining stock. 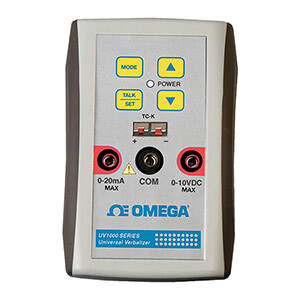 The new UV1000 OMEGASAYS® universal verbalizer is a handheld, process-signal to speech device that actually talks! It can can verbalize 0 to 10 Vdc, 0 to 20 mA, and Type K thermocouple inputs. Configure the verbalizer using the RS232 PC interface to specify the input range, engineering scale, engineering unit, and high and low alarm set-points. Select from over 100 engineering units while configuring the verbalizer. The front keypad allows the user to select different inputs, command talk, and adjust volume control. The UV1000 is a perfect solution for verbalizing any type of control signal where a local display may not be available. TRY THE INTERACTIVE DEMO BELOW! NOT INTENDED TO BE USED IN MEDICAL APPPLICATIONS OR USED ON HUMANS TRY ME! CLICK BUTTONS IN PRODUCT IMAGE!